Visual thinkers, also known as spatial thinkers or right-brained thinkers, process information primarily through visual means. They often see words as a series of pictures and are probably skilled at recognizing patterns, paying attention to detail, visualizing, and spatial reasoning, and they may be gifted at art, design, or working with their hands. Visual thinking is also a very useful skill to have in the digital marketing industry. Visual thinkers are well-equipped to handle the constant changes happening in marketing. If you’re looking to fill any of these positions in 2017, consider hiring a visual thinker. Mobile is becoming increasingly important for marketers. Mobile also has specific design needs that visual thinkers excel at recognizing. The number of mobile users first surpassed the number of desktop users in 2014. In 2016, digital media time spend on mobile was 65 percent, compared to time on desktop’s 35 percent. While desktop is still important, growth today is coming from mobile. Thirty-eight percent of people will leave a website if the layout is visually unappealing, so design is clearly very important. Mobile has its own set of design challenges, including a small space to work with, as well as differing screen sizes and operating systems between devices. Visual thinkers will be able to visualize how these differences will affect a design and come up with creative solutions. They also have a knack for what looks good and are more likely to design a mobile user interface that people will enjoy looking at. Hiring a visual thinker as your e-commerce specialist could boost your online sales noticeably. In fact, to 93 percent of consumers, visual appearance is the key deciding factor in whether or not they make a purchase. Fifty-two percent will leave a site if they don’t like the way it looks. It’s plain to see: Visuals can really make or break your e-commerce site. Videos can boost sales, too. Ninety-six percent of shoppers say videos are helpful when deciding to make a purchase online. Since visuals are so important to making sales, doesn’t it make sense to have someone who thinks visually in charge of your e-commerce? As mentioned earlier, users will leave a website if they don’t find it visually appealing. It’s a UX designer’s job to make sure the user’s experience makes them want to stick around. It’s not just through mere observation that we know how important visuals are to user experience—it’s in our biology, too. Seventy-five percent of sensory neurons in the brain process visual information, which is a lot of brainpower devoted to the visual. A visual thinker is more likely to be able to pick out exactly what visual aspects are disrupting someone’s experience with your online content. They’ll also be able to visualize the solution to the problem and see the big picture of how your digital media works together to shape the experience it provides. Outdoors company The North Face created an interactive webpage using Verse, a tool for creating interactive web content, that won them a Webby award in 2016. The page features interactive video of two North Face climbers on their attempt to scale Mount Everest. The content is visually striking and very engaging. Virgin America also won a Webby for a simpler design—the one it uses on its website. The site features a pleasing color scheme, easily navigable menus, and fun icons. Visual social media platforms are gaining popularity, and posts that contain visuals perform better on any social site. Given this visual trend, it makes sense to hire someone to whom visual content makes sense. Snapchat was the fastest-growing social media platform in 2016. Instagram also saw huge amounts of growth. What do those two platforms have in common? They’re both visually based. Facebook and Twitter also introduced popular live video functions this year, boosting the prominence of their visual aspects. Posts that include imagery also perform better than those without it. Tweets with images receive 150 percent more retweets, and Facebook posts with images get 2.3 times more engagement. Oreo’s Facebook page is a great example of using pictures and video to their full potential. Oreo’s visual posts are engaging and visually appealing. The result is that followers notice their updates, enjoy their posts, and probably ending up craving Oreos. If you hire a visually minded social media coordinator, they’ll be able to design posts that are engaging and pleasing to the eye. They’ll also be able to visualize long-term calendars for your various social accounts. If there’s one thing we can take away from this post, it’s that visual content will be huge in 2017. Incorporating pictures and videos into your content strategy will definitely increase its effectiveness. Content strategists are the ones who develop specific plans for using written, pictorial, video, audio, and other forms of content to reach business goals. 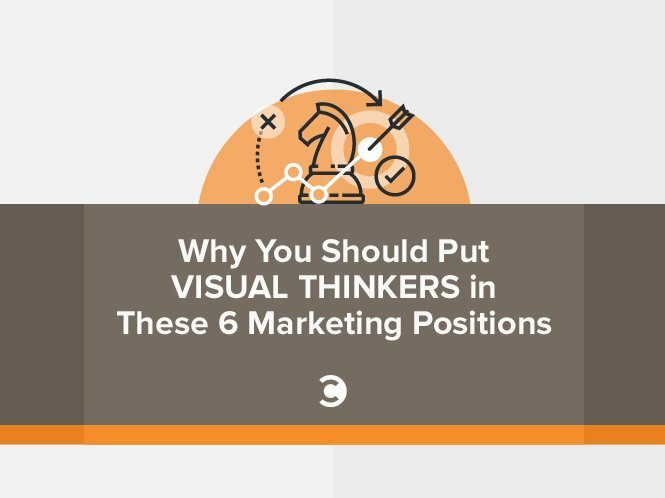 Visual thinkers are perfect for the content strategist job, not only because they can create beautiful content, but also because they’re great at strategic planning, pattern recognition, and attention to detail. They’ll be able to identify both specific details and long-term trends to assemble a successful content strategy. Visual thinkers will also, of course, be able to design visually pleasing content and blog layouts, like this blog by Help Scout, a customer service software company. Help Scout’s blog uses bright colors and fun illustrations to make their site easy on the eyes. Similar to how aesthetically pleasing website and social media posts attract people and increase engagement, good-looking emails may also be more effective. Using visuals may make people more likely to open your emails. Using the word “video” in the subject line increases open rates by 19 percent and click-through rates by 65 percent. A visual thinker can make your emails look appealing and create visual content to send out to your email list. They’ll probably also be good at planning an email marketing strategy due to their skills with strategic planning. This email designed for Royal Dutch Airlines by Piotr Swierkowski is a prime example of using layout, shapes, colors, and photographs to make an email really shine. Visuals, whether they’re in the form of photographs, video, drawings, or infographics, are becoming more and more important, and they’re definitely going to be huge for digital marketing in 2017. Websites, blogs, social media, email, and virtually any other channel you can think of can benefit from the use of visuals. Businesses in virtually any industry can use them, too. Who better to create and plan these visuals than a visual thinker? People who think visually know what will look good and how to utilize visuals for achieving business goals.